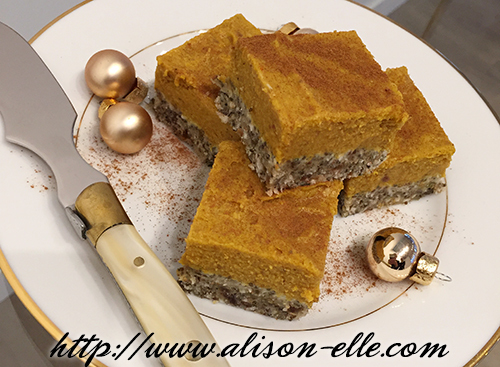 It has been a ridiculously long time since I did one of these kitchen adventures posts, but I was so excited about these Nut-Free No-Bake Paleo Pumpkin Bars that I had to share. My good friend and personal trainer recently opened her own fitness studio (if you follow my Instagram, you may have noticed that I have been hanging out at Blythe Toning Studio a lot) and along with working on our fitness, we have recently been into experimenting with new recipes. These bars came about after a discussion on how we could make "healthy" holiday treats since December can often be a bad month when it comes to maintaining one's eating habits. 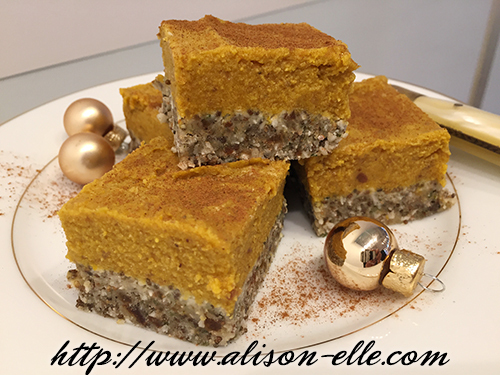 Since I have a severe nut allergy, we adapted this recipe and made it even healthier by throwing in some chia seeds and hemp hearts. Not only was it super easy to make with no actual baking required, the result is delicious (especially if you love coconut) and packed with protein! 1. Line an 8x8 baking dish with tin foil. 2. Add the ingredients to a food processor and process until crumbly like a crust. 3. Scoop the crust into the baking dish and press down with a spatula. 1. Add the ingredients to a high speed blender (we used a Vitamix) and blend until smooth. 2. Pour on top of the crust and spread evenly with a spatula. 4. Pull out by lifting by the tin foil and cut into bars. 5. Dust with ground cinnamon before serving.